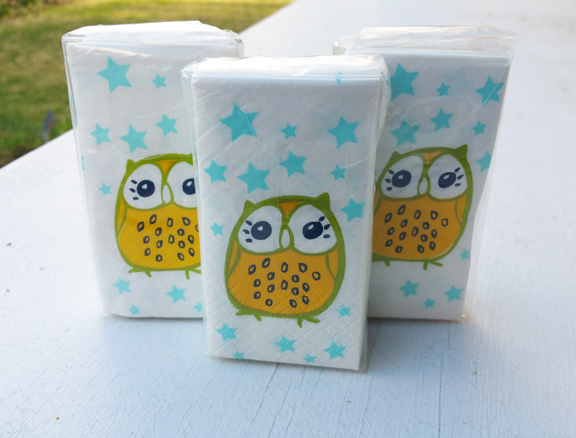 This entry was posted on August 1, 2018 by thatpartychick. 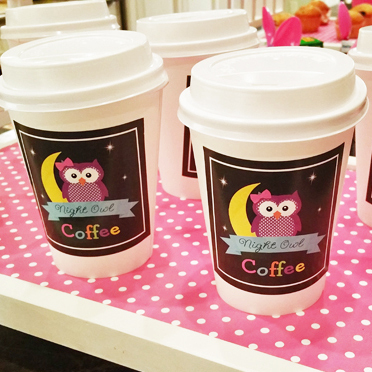 A whimsical night owl themed sleepover was the perfect choice for this special birthday! 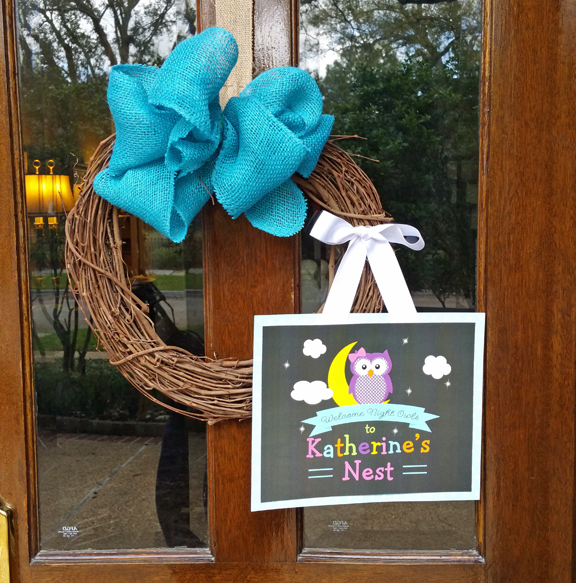 Guests were welcomed to “Katherine’s Nest” with a fun party signs hung on grapevine wreaths at the front door! 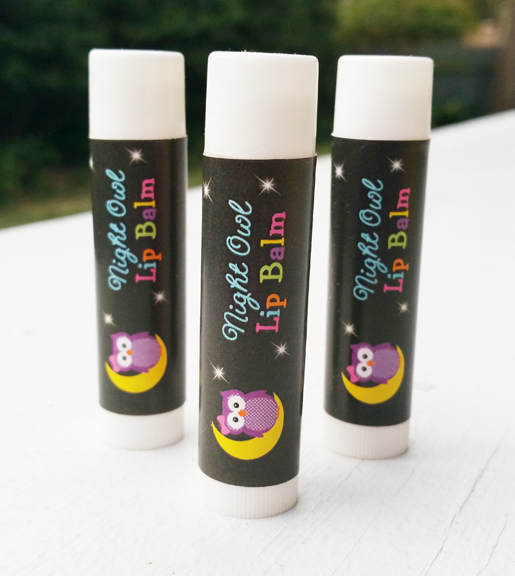 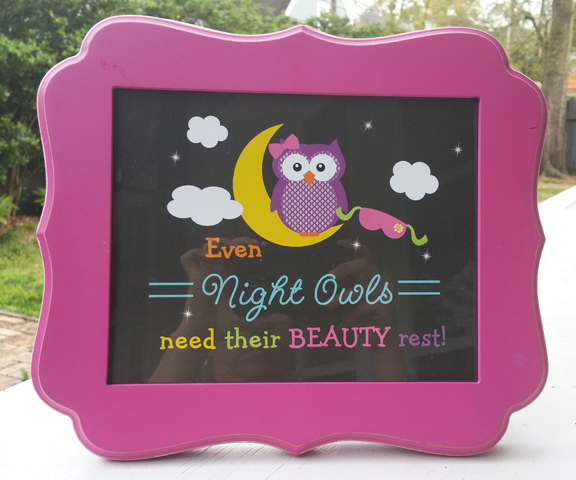 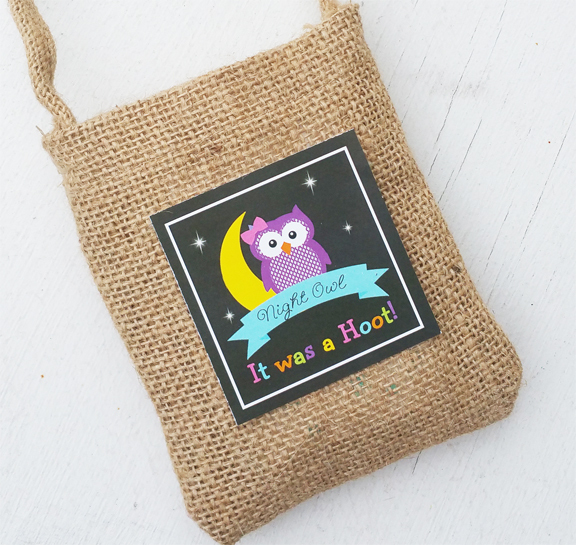 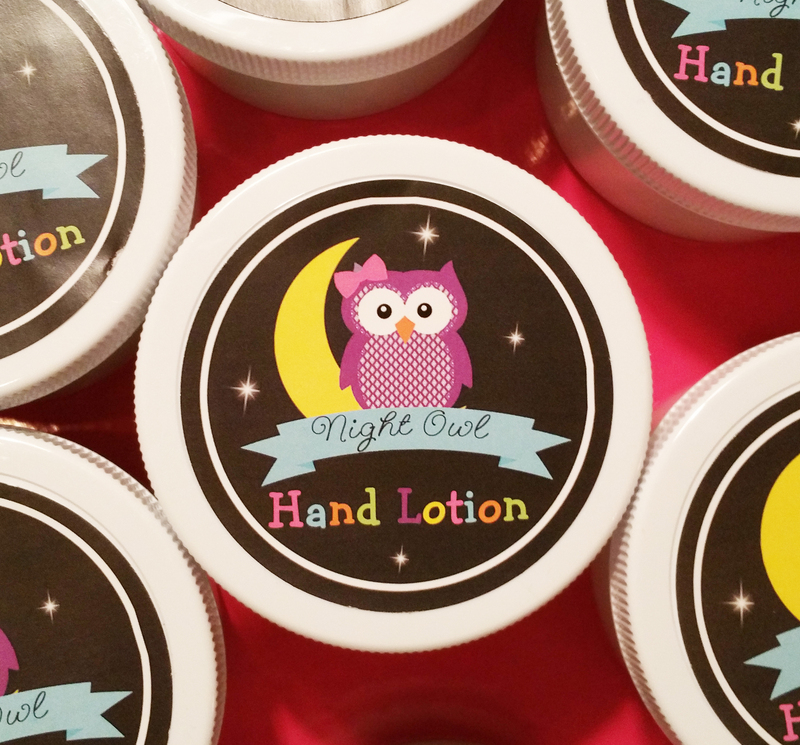 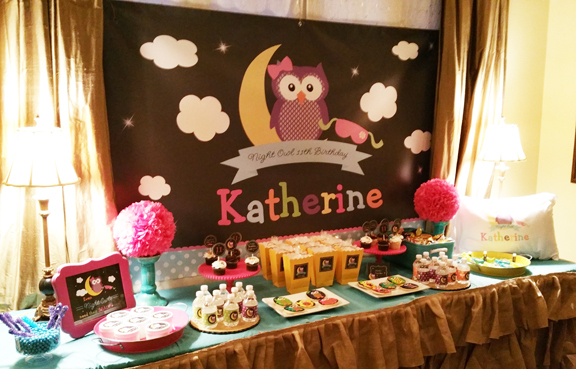 Bright colors set against a chalkboard backdrop featured an owl with a sleep mask resting on a crescent moon! 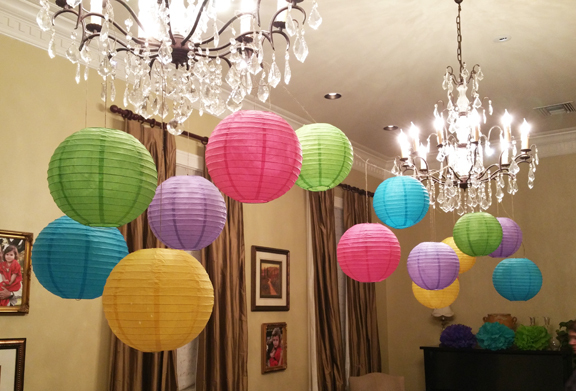 Overhead colorful paper lanterns gave the room a festive touch. 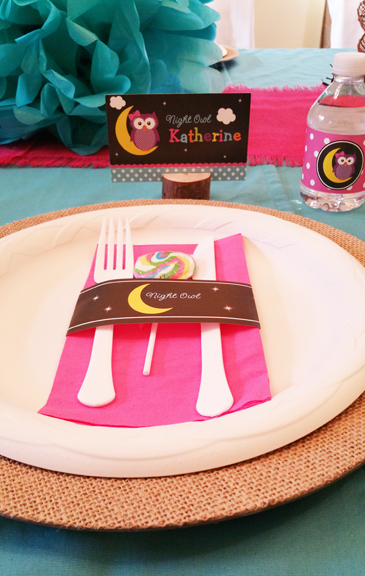 The table was set with a blue cloth with a pink table runner. 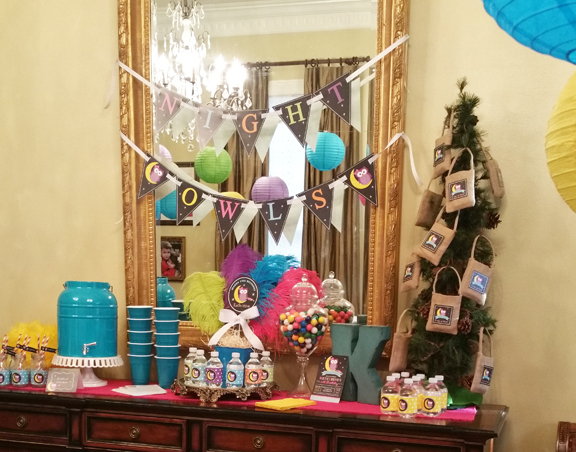 Nest centerpieces, included colorful birthday party circles, and alternated with tissue pom poms as a focal point. 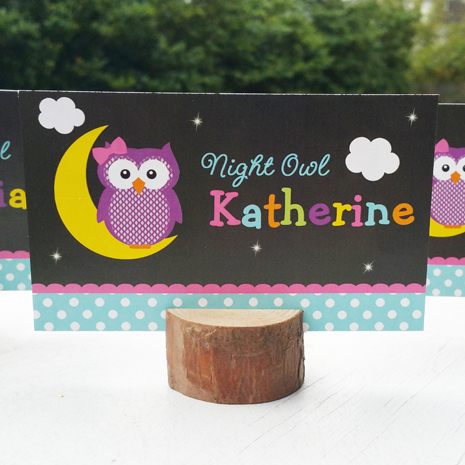 Personalized place cards were stylishly set in log card holders at each setting. 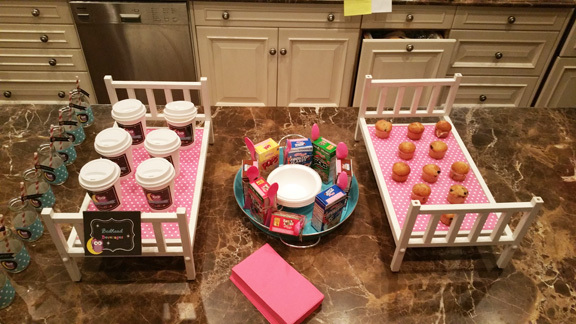 Burlap chargers held the dinnerware, and place settings included lollipops with pink napkins and cutlery neatly wrapped with a napkin holder. 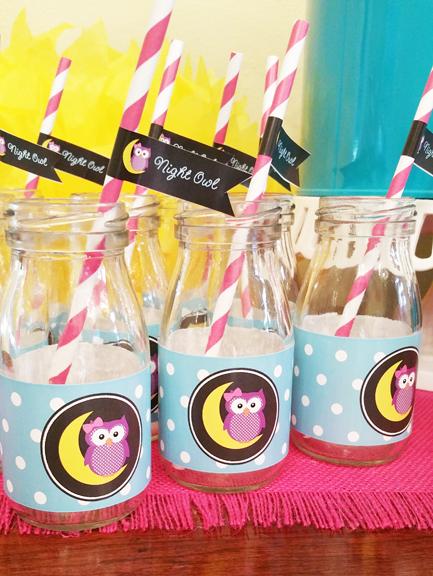 A variety of sweet and salty selections were on the snack table, which was dressed with a teal blue tablecloth as well as a burlap table skirt. 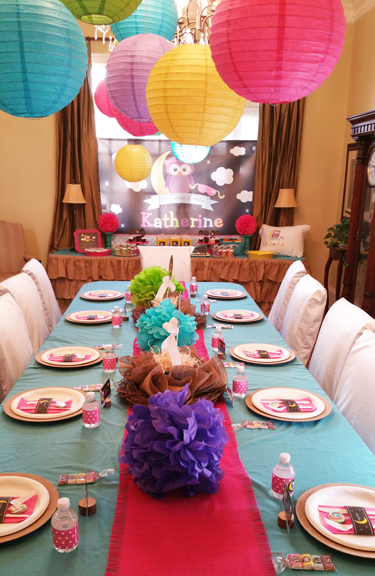 Pink tissue pom pom flower balls rested on blue candle holders. 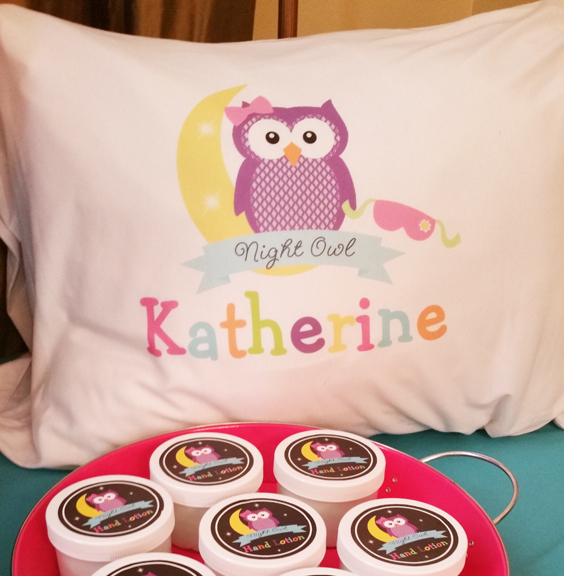 Katherine’s Night Owl pillow carried out the sleepover party theme. 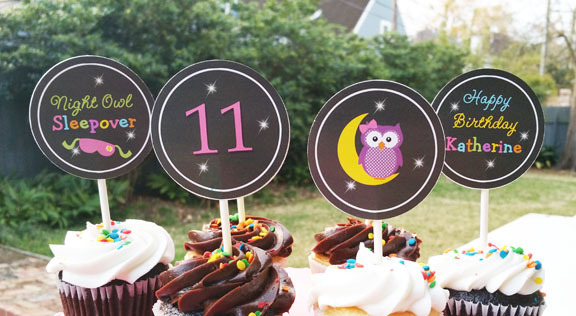 Cupcakes included colorful cupcake toppers. 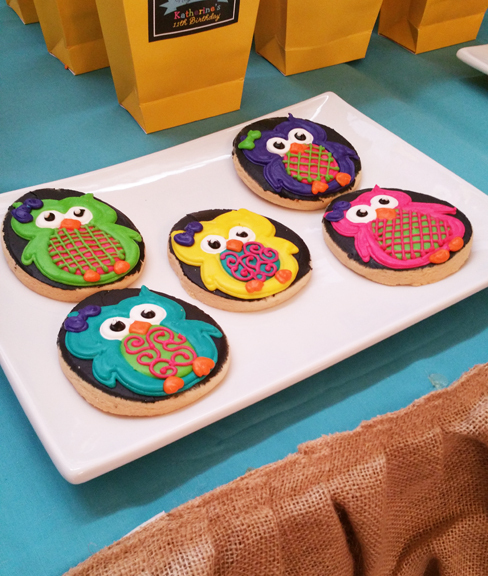 The owl cookies were a favorite. 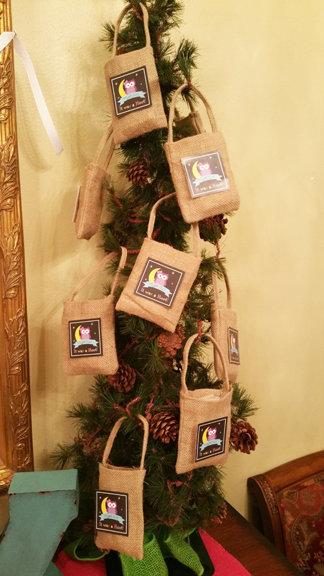 Rock candy sticks were arranged in a bowl of colorful chocolate candies. 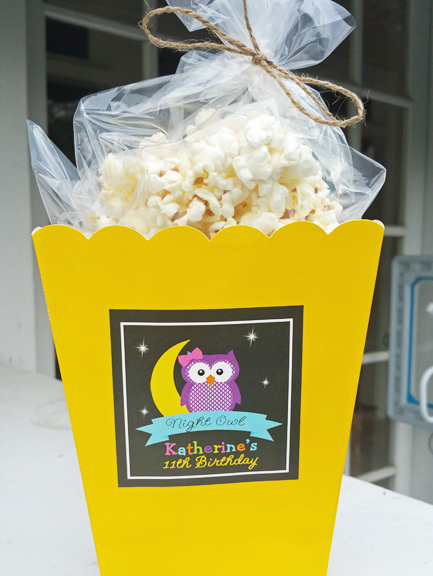 Colorful stickers added interest to the popcorn boxes. 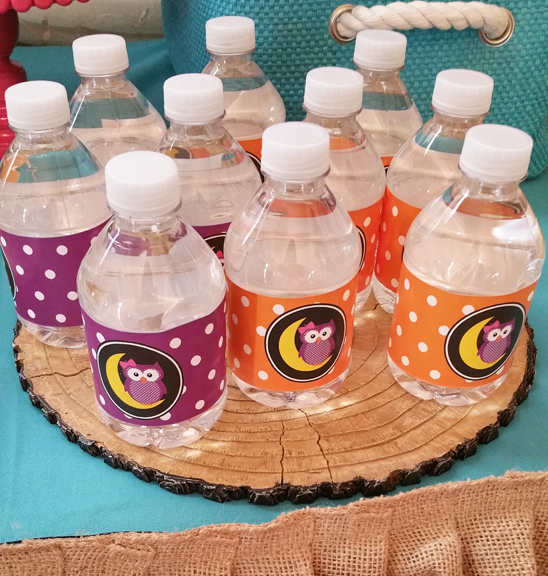 Personalized water bottles were served up on tree slice platters. 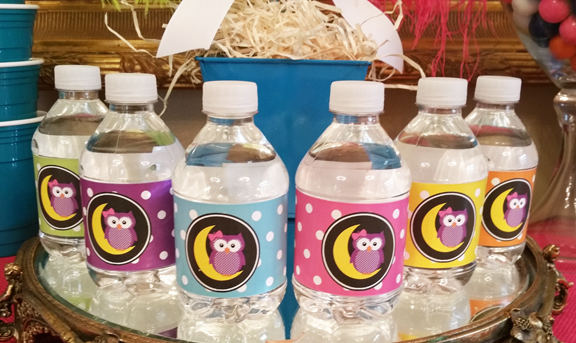 Milk bottles included the owl logo against a blue polka dot background. 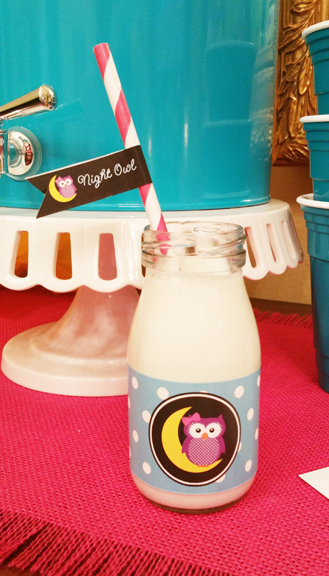 Pink and white striped straws were decorated with night owl straw flags. 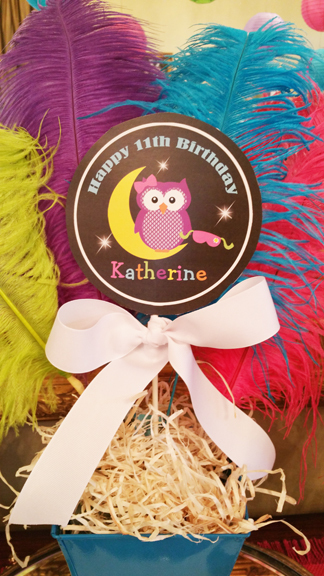 A personalized party Centerpiece Topper was nestled among colorful feathers at the beverage station. 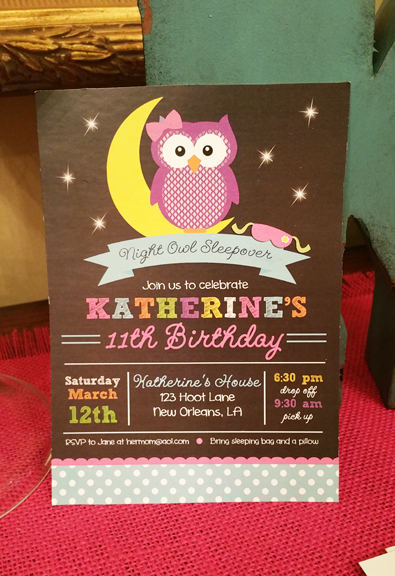 A party banner added another decorative detail to the design! 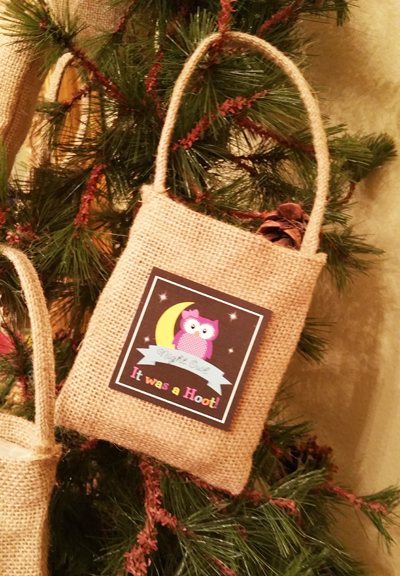 Canvas favor bags were hung on a woodland tree. 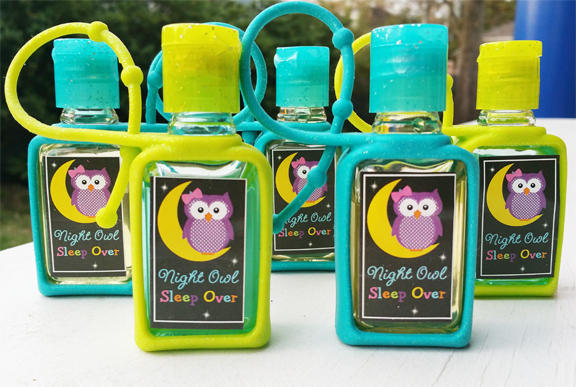 Favor bags included adorable favor tags proclaiming “It was a Hoot!” Partygoers stashed party favors including hand sanitizer, lip balm, and beauty cream, all with party themed stickers. 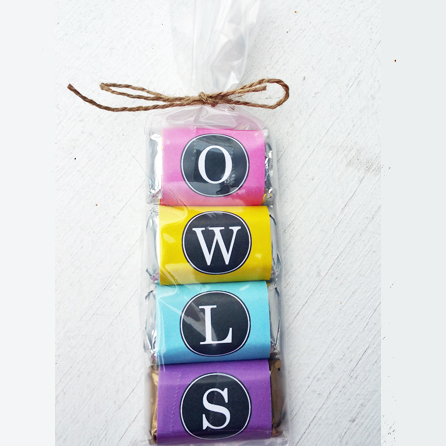 Miniature Hershey bars wrapped in the letters “O-W-L-S” were arranged in clear bags and tied with twine! 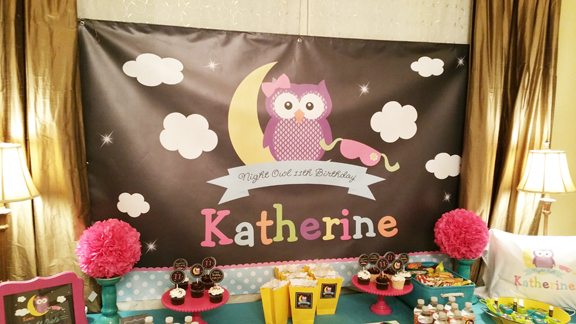 In addition to a Bounce House, a number of party games kept the action organized and fun. 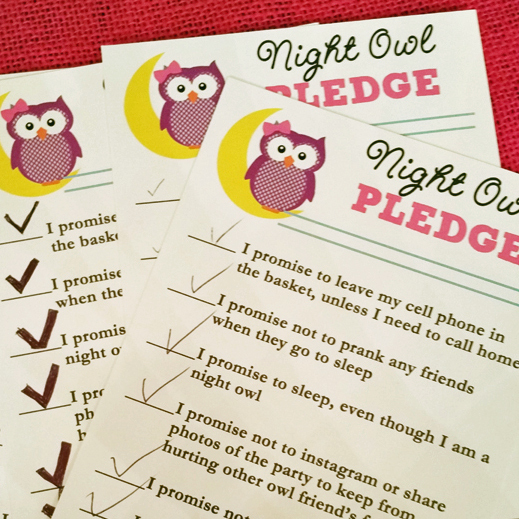 The Night Owl Pledge was an opportunity for the girls to sign off on expected good behavior, which made for a more enjoyable evening for all involved. 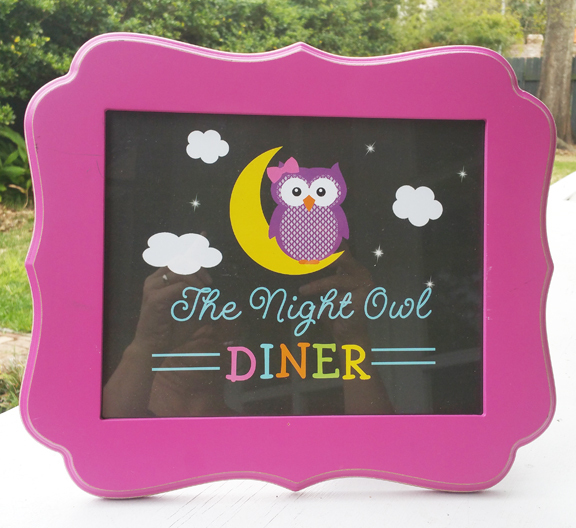 The Night Owl Diner featured late night- early breakfast options on beds. 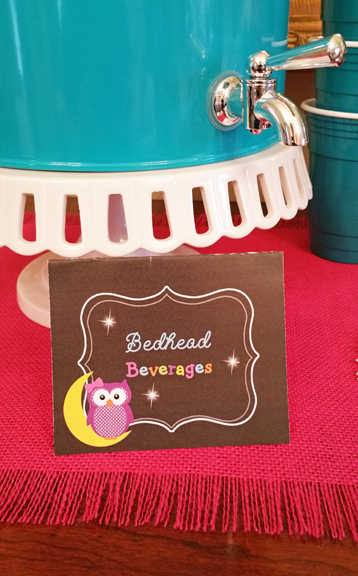 Of special interest were the Bedhead Beverages, such as milk, juice, and “night owl coffee” in special cups with labels in keeping with the party theme. 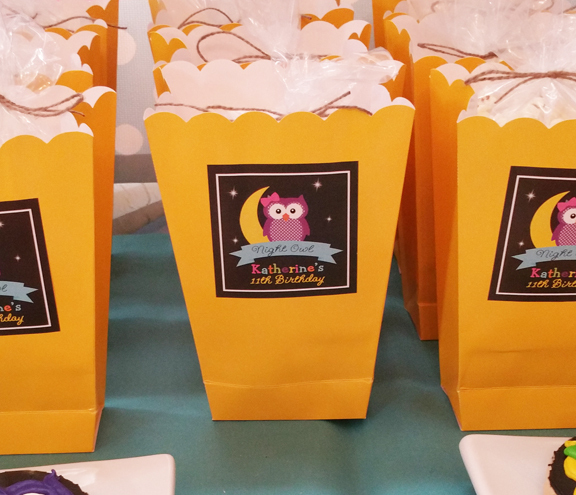 Assorted cereals, muffins, and fruit completed the breakfast menu!